ISLAMABAD (92 News) – Malaysian Prime Minister Dr Mahathir Mohamad has urged urged need to find ways to combat Islamophobia, saying that there is fear, hatred and enmity towards Muslims and this is why Christchurch attack took place. Addressing a joint news conference with Prime Minister Imran Khan on Friday, he said that Pakistan and Malaysia understand the issue of combating Islamophobia. “Pakistan and Malaysia can also cooperate on this particular issue with the aim to bring improvement in the perception of Muslims and reduce hatred and fear towards Muslims, he explained. “I think we can exchange information on how to combat corruption in our countries. I am honoured to be attending Pakistan Day,” he mentioned. Pakistan and Malaysia have agreed to strengthen their economic relations by promoting trade and investment for mutual benefit of two countries. The understanding came at a meeting between PM Imran Khan and his Malaysian counterpart in Islamabad. The Malaysian PM Mahathir said both the countries have identified the areas of mutual cooperation which could prove to be beneficial for both the countries. He said traders of both countries will be facilitated in doing business with each other. Dr Mahathir said his country has set the target of becoming a developed country by 2025. He regretted that there is not a single Muslim country in the category of developed nations. He said other Muslim countries should also strive to develop themselves at par with the developed countries. On the occasion, PM Imran appreciated the Malaysian PM for taking a stand for Muslims in the aftermath of the New Zealand terror attacks in which at least 50 Muslims, including nine Pakistanis, were killed. The prime minister the stance of Mahathir Muhammad against corruption saying his party has been waging a struggle against corruption over the last twenty two years. “Corruption is what destroys institutions and takes away money that should be spent on human beings and on human development,” he added. PM Imran Khan said Pakistan has always looked upon Malaysian Prime Minister as a Muslim statesman who changed his country. Responding to Islamophobia in the world, he said it has badly affected the Muslims and expressed the confidence that the Malaysian Prime Minister will also forcefully take a stance on the matter. “In the Muslim world, there are only two leaders who stand out and who actually transformed the society. One of them is Malaysian prime minister and we watched as Malaysia was transformed. The other was Turkish Prime Minister Erdogan. We saw the change in Turkey and the GDP going up,” the prime minister said while answering to a question. To another question, the premier said that Pakistan wants to learn from Malaysia’s experience of tourism. Pakistan with vast resources generates nothing from tourism. 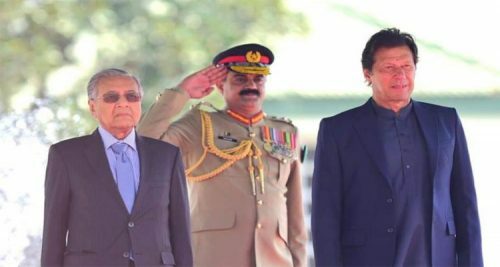 Earlier today, Malaysian Prime Minister Mahathir Mohamad, who is on a three-day visit to Pakistan, was presented a guard of honour at the Prime Minister’s House . A smartly turned out contingent of the armed forces presented the guard of honour to the visiting dignitary as he arrived at the PM’s House. On the occasion national anthems of both the countries were played and a smartly turned out contingent of the armed forces presented guard of honor to the visiting dignitary. Later, Prime Minister introduced his cabinet members to the Malaysian counterpart. The Malaysian delegation was also introduced to Prime Minister Imran Khan. The Malaysian Prime Minister also planted a sapling at the Prime Minister House.